Many years ago, when my dear learning partner of close to a decade, Sara Debbie Gutfreund, and I were discussing things we love to do, she told me “I love to run.” At the time, I will confess, I thought that was majorly strange. Who enjoys running? Running is painful and hard! But over the years of our friendship, I have learned from Sara Debbie that there are people who enjoy running. And Sara Debbie is one them, and she is also very good at it! She is a champion runner and yesterday, after months of tough training, she ran alongside Olympians in the New York Marathon, finishing with a fast-enough time to qualify for the Boston Marathon next year. What I love about Sara Debbie’s running is that it is so her. It is, as Rabbi Nivin puts it, AUTHENTIC for her. 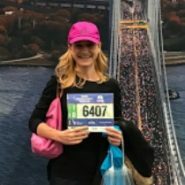 She loves running, it gives her energy, it gives her simcha to be a devoted wife and a JewishMOM to her five wonderful children. That’s what happens when we are authentically who we are. It empowers us to live our lives. There aren’t so many Orthodox moms who are champion marathon runners. 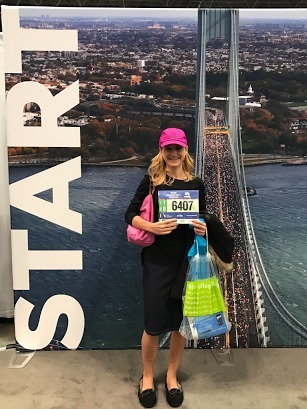 Her modest head covering and skirt earned her some special cheers of support when she sped through Boro Park yesterday as part of the marathon. Way to go, Sara Debbie! I am so proud of you! Loved this story! I am non-Jew mum with a great respect to Jews mums (NB: I’ve been learning a lot from them!). I would never ever make a comment: “What, you won in a skirt? !” Oh well, some ladies run NY marathon in bikini & no one makes such a comment. I read Sara’s inspiring story also here (http://www.chabad.org/theJewishWoman/article_cdo/aid/3131973/jewish/How-I-Connect-to-G-d-During-My-26-Mile-Morning-Run.htm).